* Uses a 26650 5500 mAh high-rate discharge lithium battery, the main light and side light dual light source design. * Can be used as a mobile power supply, use the USB adapter provide power to other devices, the maximum output to 2.2A; with a discharge capacity reminder. * Uses constant current circuit, with high battery efficiency, stable output, no flashes. * Anti-reverse design to prevent incorrect battery installation causes the circuit damage. * Battery power detection, charging instructions, low battery reminder function. * With locking function to prevent accidental illumination. * With flashlight self-location function. 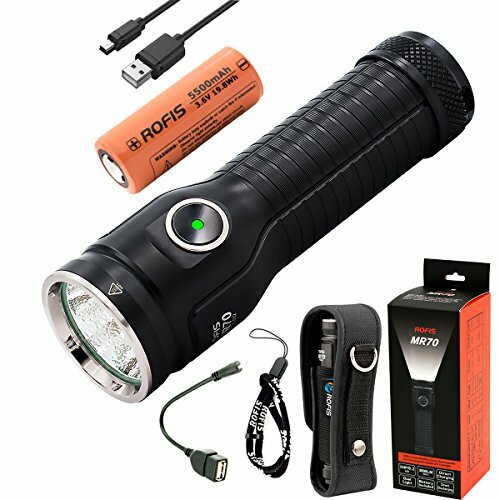 ROFIS MR70 is a brand new multifunctional ultra bright rechargeable flashlight with dual light sources, using a 26650 lithium battery. The main light utilizes CREE XHP70.2 cool white LED with an output range of 3,500,while the side light utilizes CREE XP-G2 warm white LED, maximum output up to 200 lumens. The flashlight body is constructed from 6061-T6 aluminum alloy, and is processed with premium Type III hard-anodized anti-abrasive finish. One-piece shell, the structure is stable and reliable. One-touch control all functions, it is easy to operate. Body with Micro-USB charging, which supports up to 2A charge. The MR70 is designed with built-in charging and discharging function, it offers direct access to charge the flashlight and also can be used as a power bank,use the USB adapter provide power to other devices, the maximum output to 2.2A; with a discharge capacity reminder. With the utilization of dual light sources and practical purpose, both main light and side light have 3 brightness level, the light delivers output range from 3 lumens to 3,500 lumens.With its long runtime, the MR70 is allowed user to use in outdoor trip and household general illumination, making the light a necessities for household use or travel activities. If you have any questions about this product by Rofis, contact us by completing and submitting the form below. If you are looking for a specif part number, please include it with your message.